I write a lot of book reviews on Self Help Daily. Generally, I’m sent books from publishers or even authors in exchange for writing and publishing a review. I’ve received some really amazing books and I always strive to “do right by them” in my reviews. The last book I read was Appointments with Heaven: The True Story of a Country Doctor, His Struggles with Faith and Doubt, and His Healing Encounters with the Hereafter . Here’s the problem: There is absolutely, positively no way on earth I can possibly do right by this book or even come close to doing it justice. You can completely understand, yourself, that it feels like Christmas morning any time your children come to visit, but trying to put it in words? Nearly impossible. Even someone like me, who works with words every day of the year, can find their brain overwhelmed by their emotions and realize that, in the end, the brain is no match for the heart. Meet the country doctor who visits the front porch of Heaven… and witnesses what awaits us there. When a patient first asked Dr. Reggie Anderson to sit at her bedside as she passed from this life, something miraculous happened. As he held her hand, the veil between this world and the next parted… and he received an astonishing glimpse of what awaits us in Heaven. 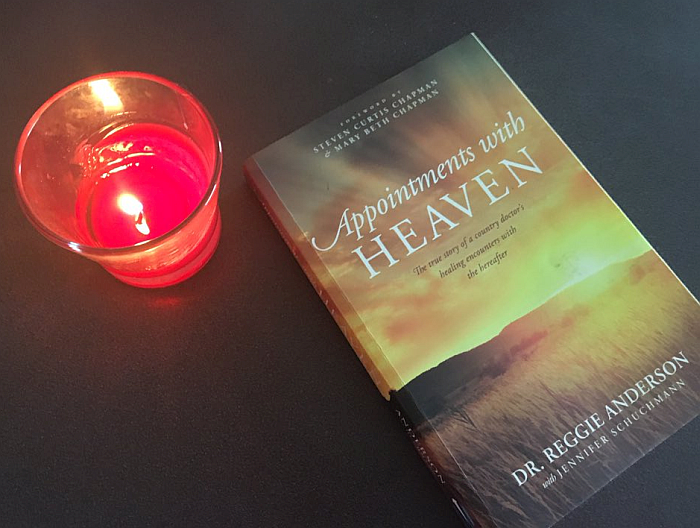 Little did he know this was just a foretaste of what was to come – a lifetime of God-given “appointments with Heaven.” Join Reggie as he shares remarkable stories from his life and practice, including the personal tragedy that nearly drove him away from faith forever. As he reveals what he’s seen, heard, and experienced of the afterlife, we’ll learn how we can face the passing of our loved ones with the courage and confidence that we’ll see them again; discover what might happen when we expect the miraculous; and prepare for our own appointment with Heaven. Soul-stirring and hope-filled, Appointments with Heaven is a powerful journey into the questions at the very core of your being: Is there more to life than this? What is Heaven like? And, most important: Do I believe it enough to let it change me? I’m intrigued with this particular book possibly more than I’ve ever been intrigued by a book (not counting the Bible, which intrigues me every time I open it). Appointments with Heaven reads in an exciting, I can’t turn the pages fast enough fashion similar to an Agatha Christie mystery or John Grisham novel. Literally, each person author Dr. Reggie Anderson wrote about, I found myself longing for an entire book written about them and them, alone! I could read a novel centered, exclusively, around the life of Dr. Anderson’s mother, father, wife, patients, or friends (Stephen Chapman and Mary Beth Chapman). When he spoke of his childhood, I only wanted to hear more. 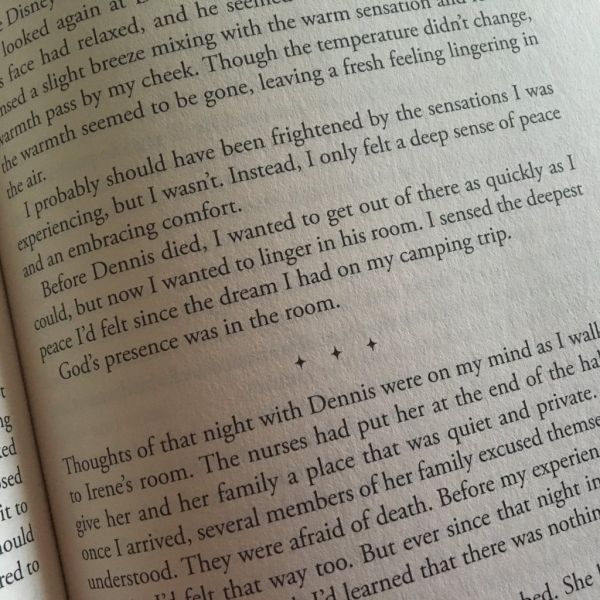 His writing style made you feel as though you were there with the child version of him, and you could “feel” the love his family had for one another. Every time Dr. Anderson wrote about one of his patients (particularly the ones in nursing homes), I’d find myself wondering what their personal histories were. He made everyone and everything he wrote about beyond fascinating. If Dr. Anderson had written textbooks, I’d have paid more attention in school! If you’re familiar with me at all, you know I’m a baseball fanatic. Seriously, if the St. Louis Cardinals are on my tv and you have something to say to me, you might want to wait between innings – and approach me then with caution if it’s a close game! I once told someone, half kidding, that as far as I was concerned, there were two seasons: Baseball Season and Withdrawal. One of the things I love about baseball SO MUCH is that you never know which pitch, which at bat, or which defensive play will change the momentum of the game. It usually comes when you aren’t watching for it and, even more fascinating, it often comes from a player who isn’t even re-mote-ly a “franchise player.” These “game changers” are often the players most people overlook, but they’re usually my personal favorites. They’re often the difference between winning and losing. This year, in fact, it was one of these “game changers” that (in my opinion) was the key to our successful season. The guy no one was talking about in April, everyone was talking about in October. If Appointments with Heaven were a baseball player, it would be this type of player. There are books by more famous authors, such as Max Lucado (one of my personal favorite authors). There are books with titles that are being tossed around for movies and television series. These would be the “franchise” players with names on the back of everybody’s jerseys! And yet… sitting on another shelf, there’s a beautifully written book with an author’s name you’ve surely never heard of – a very humble “country doctor” in Tennessee who isn’t even re-mote-ly a household name. A guy not even on the most avid inspirational book reader’s radar with a book the may never have heard of. An author no one has heard of is the very author everyone needs to read. As you’re reading Appointments with Heaven, you’ll only think about how wonderful the book, itself, is. You’ll kind of feel miffed anytime you have to set it down, whether it’s to cook, eat, or sleep. You’ll find yourself rushing back to it as fast as you possibly can. I actually cooked supper one evening with the book in one hand while the other hand did all the work! As I said earlier, this book made me THINK a great deal. I have a lot of love for anything that makes me think. I have even more love for anything that makes me FEEL – which is the one thing Appointments with Heaven caused me to do even more than think. The reader is reminded that the often trivial things we get bent out of shape about really don’t amount to a hill of beans. We each have our own “Appointment” one day and these trivial little matters are just that – trivial little matters. It affected me another way, as well. It caused me to realize something I already knew but needed to be reminded of – everyone else has their own appointment one day as well. When you allow that fact to really sink in, it’s difficult to get annoyed with the “Sunday driver” in front of you or the “Baby Jeff Gordon” on your bumper. This particular book and this particular author is exactly what this particular world needs right now. Just about all of us have loved ones in Heaven. The longer God allows us to live on earth, the more loved ones move on before us, making Heaven sweeter and sweeter. If we picture, in our minds, eating with our family around the dinner table as a child, a lot of us would realize that we’re the only one still here. Some may have lost a father or a mother – then there are those, like myself, who lost both parents way too young. Everyone has lost someone they love (parent, spouse, child, grandparent, friend..) and sadly it’s sure to happen again. 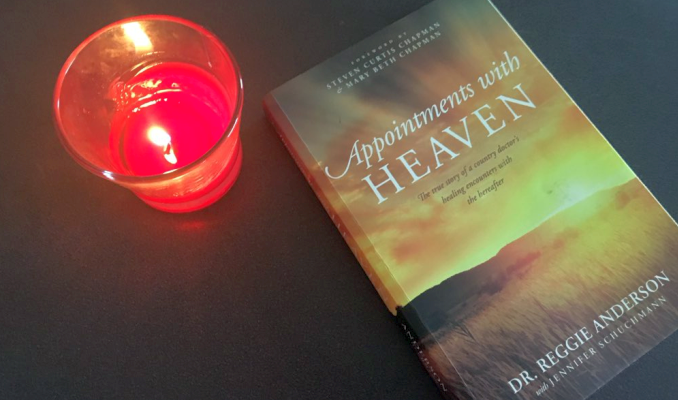 Appointments with Heaven brings much needed peace to the hearts and minds of those of us who are “left behind.” I could easily… easily… see this book healing many open wounds. There’s another way Appointments With Heaven will bring peace (and even forgiveness) to your heart. You may just see yourself through Dr. Anderson’s struggle with faith and search for “answers.” Maybe there’ve been times when you found yourself running on empty when it came to hope while the “Tank of Discouragement” was over-flowingly full. There’ll be many ways that you’ll identify with different individuals in this book and this identification can help you realize that you aren’t alone – never have been, never will be. Reason Number 4 Why This Should Be the Next Book You Read: It’s a Real Page-Turner! You come to care about the different people in Appointments with Heaven and riding the roller coaster of life with them will keep you glued to each page. Before I end this book review that’s nearly turned into a book on its own (gift of gab… who, me? ), allow me to simply say this: If I could recommend only one (besides the Bible!) book to each and every person in my life – whether online or offline – this would be the book. Appointments with Heaven will touch you deeply and its imprints will last forever. +++ Click any of the links above for the paperback edition of this book on Amazon. This book is also available on Kindle (Appointments with Heaven on Kindle). There’s also a 30 Daily Appointments with Heaven: Devotions to Bring the Hope and Joy of Heaven to Your Every Day on Kindle which sounds extra special too. Turning Your Upside Down World Right Side Up! Previous Post: « Are You Trying to Do too much?! I just finished “Appointments with Heaven” last week. I too couldn’t put it down. I have been struggling with my faith since my niece committed suicide in 2012. I kept making excuses not to go to church with my husband. One reason was that I sobbed through the whole service. After reading Dr. Anderson’s book, I have felt such an inner peace. I have loved God with all my heart, but there was this underlying question of why doesn’t God keep bad things from happening to our children. Anyway, I feel that this book has changed me for life. I hope to help others who have lost loved ones, to know that their loved ones live in a beautiful place filled with love. No sarcasm, no competition, (Im also a sports fanatic), no corruption, no lies, no sin. I look forward to my appointment with heaven. Wonderful book. Debbie, thanks SO much for sharing your story! It’s remarkable just how profoundly a great book can touch you, isn’t it? I complete agree with your choice of word: PEACE – I have so much more peace now when it comes to loved ones who have moved on to Heaven. To really and truly realize what a beautiful place they’re in now is healing. I’ll go look for this book on Amazon then. Sounds really good.